checks using Data Insight - Rules. We want to configure a Rule in Information Steward, that would Lookup into tables from ECC for Data Comparison. However while doing LOOKUP we found that this operation returns only one record. Requirement is to Lookup Multiple Records in Information Steward and Store the Values into the Table/Range/Array for the purpose of comparison. Please check the attached screenshot that mentions the requirement of one of the Rules that we want to create. For, this we would need to save the Company Codes of Vendor into a Table / Array / Range kind of Structure. And then compare the company Codes of Alternate Payee with those saved in the Range. 1.Is there Table/ Range/ Array type of structures available in Information Steward that can store multiple values? 2.In Information Steward we could not find any Iteration or Loop related Operator, that can process one record multiple times. 3.The LOOKUP Operator only returns a single record. It does not return all the records that match the Input. Thanks for the solution. We can solve this particular rule with joins. But we also have other rules that would need multiple lookups. 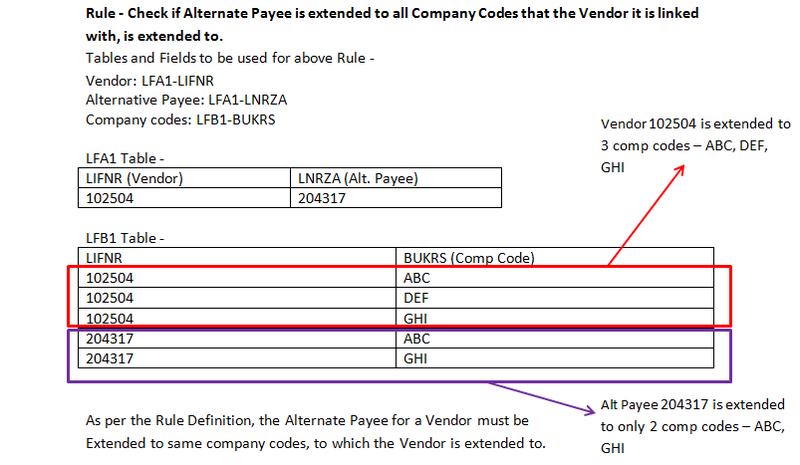 Rule : For a Vendor If vendor country = TR ,only exist for company codes TUR & BKT then language should be = TR , and if vendor exist for any other company code as well, language should be EN. For this I suppose we would need the provision to read multiple records from table and to be able to save them. While doing a LOOKUP, if there is a possibility to provide a Condition (Not Equal, Match Pattern, etc) for the lookup.